A list of this weekend’s republican commemorations by the different political organisations involved. Check locally for any last-minute changes. Easter Sunday, Belfast, Republican Plot, Milltown Cemetery, assemble 12 noon at gates of cemetery. Holy Saturday, Lurgan commemoration, assemble at the top of Kilwilkie at 3pm for march to the Republican Plot, St. Colman’s Cemetery. Easter Sunday, Armagh City assemble 2.45pm at the gates of Sandyhill Cemetery. Easter Saturday, wreath-laying ceremony at the Republican Plot, Carlow cemetery at 3.30pm. Easter Sunday, assemble at Wilton Roundabout, 2pm. Parade to Republican Plot, St. Finbarr’s Cemetery. Cuchulainn Memorial, City Cemetery, Derry City, Easter Sunday, assemble at 12 noon. The Loup Cemetery, 9am, at the grave of Brigadier Sean Larkin; and the grave of Tommy Toner in Dungiven, 10.15am at the graves of Vols Kealy, O’Carolan and Kilmartin and hunger striker Kevin Lynch. Drumboe Easter Sunday, assemble Johnson’s Corner 2.30pm. 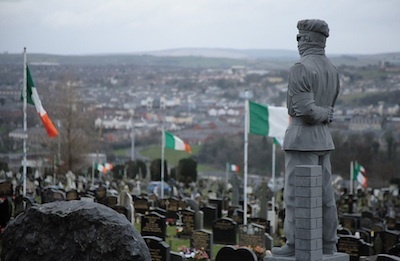 Easter Sunday, Newry, assemble 10am, gates of St. Mary’s Cemetery for march to Republican Plot. Easter Monday, Assemble Garden of Remembrance, 1.45pm for march to GPO, O’Connell Street, Dublin. Holy Saturday, wreath-laying ceremony, Kilcummin Cemetery, Oughterard, 7pm. Assemble at Cathedral for parade to Liam Mellows Memorial, Eyre Square, Galway City, Easter Sunday, 11am. Republican Plot, Donaghpatrick, Headford, Easter Sunday, assemble Queally’s Cross, Caherlistrane, 3pm. Holy Saturday, wreath-laying ceremony, Republican Plot, Caherlistrane Cemetery, 2pm. Tralee, Easter Sunday, assemble at Denny Street at 2pm for parade to Republican Plot, Rath Cemetery. Easter Monday, Republican Plot, Listowel, wreath-laying ceremony, assemble at graveyard gates, 12 noon. Easter Sunday, commemoration at the Republican Plot, Grey Abbey Cemetery, Kildare town, 1pm. Wreaths will be laid on the graves of William O’Connor and James Lacey, Barrowhouse Cemetery; grave of Denis O’Dwyer, Wolfhill cemetery and the Republican Plot, Portlaoise. Holy Saturday, commemoration at the grave of Vol. Patrick Gill, Jamestown, 3pm. Easter Sunday, commemoration, Clonboney, Ballinalee, at the graves of Sean Connolly and Tommy Kelliher, 3pm. Dundalk, Easter Sunday, assemble at gates of St. Patrick’s Cemetery, 2.30pm for wreath-laying ceremony at the Republican Plot. The Annual Mayo Easter Commemoration will take place on Easter Monday April 1st at 12pm in Kilkelly. The parade will meet in Kilkelly and march to the East Mayo Brigade Memorial on main Sligo-Galway Road for the main commemoration. The main speaker of the day will be Mary Ward. We invite people to come to this event in honour of those who have given their lives for Irish freedom. Easter Sunday, wreath-laying ceremonies at grave of Seamus Fox, Drumree, 12 noon; at grave of Niall Fagan, Summerhill, 1pm; at Ballinlough Cemetery, Kells, 2pm. Easter Monday, wreath-laying ceremony at grave of Vol. George McDermott, Ardbracken, 2pm. Easter Sunday, Commemoration, Urbleshanny Cemetery, Scotstown at grave of Vol. Seamus McElwaine, 2pm. Cumann na Saoirse Naisiunta (The National Irish Freedom Committee) will hold it’s Easter Commemoration on Easter Sunday March 31 at 9.00am at the grave of its’ co-founder Joe Stynes in Woodlawn Cemetery, East 233 St., Bronx, NY. The graveside ceremony will include a reading of the 1916 Proclamation of the Irish Republic, the significance of Easter to Ireland’s freedom struggle, the Republican Movement’s Easter Statement, Cumann na Saoirse Easter Message and the laying of the wreath at Joe Styne’s grave. After breakfast ‘the Countdown to Easter 2016’ program will commence. This program, initiated in 2010 by the late Brian Mor O Baoighill, will include tributes to the executed signatories of the Easter Proclamation and to the other executed Leaders of the 1916 Easter Rising. Easter Sunday, County Commemoration, Kilglss, Strokestown at the grave of Frank O’Donoghue, 3pm. Sligo Town, Easter Sunday, wreath-laying ceremony, Republican, Sligo Cemetery. Easter Sunday, commemoration, Hunger Strike Memorial, Banba Square, Nenagh, 10am. Holy Saturday, wreath-laying ceremony at Statue on Quay, Waterford city, 12 noon. Easter Sunday, 3pm, 2013 County Comemoration, Meedin Cemetery, at the graves of Patrick Seery and Paddy Geraghty. Wreath-laying ceremonies will take place throughout the County at Republican Graves and Monuments over the Easter period. Republican Plot, Stt Ibar’s Cemetery, Crosstown, Easter Sunday, assemble at Cresent Quay, Wexford at 3pm. Mass for all who died for Ireland, Church of the Immaculate Conception, Rowe Street, 11.15am. Holy Saturday, wreath-laying ceremony at 1798 monument between Tinehealy and Shilleagh. Wreath-laying ceremmony at the Seamus O’Brien Memorial, Post Office, Rathdrum, 1pm. Assemble at the entrance to the City cemetery at 2.00pm on Easter Monday. Main speaker Francie Mackey. An event is also organised in Cork: Assemble 31st march, 1 o’clock, TSB, Clashduv road, Togher for march to St. Finbarr’s cemetery, Wilton. * Note that the Dominic and Mary McGlinchey independent commemoration takes place at Deerpark Road, Bellaghy at 4.30pm on Easter Saturday afternoon.